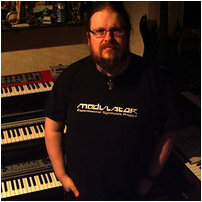 Modulator ESP is Jez Creek, an electronic ambient artist from Nottingham in the UK. Jez has been messing around with synthesizers for over 20 years. He started making solo improvised electronic music in 2004, originally in a melodic / rhythmic Berlin School style, but in recent years he has been expanding into ambient, drone and other more experimental sonic territories. Back in the old days his live performances required "lots of gear", but since he began playing gigs in the USA with only what can be carried on a plane as hand luggage, he has streamlined his live rig enormously. Now his sets revolve around a small number of sound sources, run through effects and then layered and looped. Although this approach is more suited to experimental ambient pieces, he also uses sequencers and other rhythmic devices from time to time. Synthesizers and samplers are chosen for their ability to control and manipulate sound in performance. Improvised loops can be reversed, pitch-shifted and/or time-stretched on the fly for maximum sonic manipulation. Jez has a large body of music available from a variety of sources, much of it available under Creative Commons. He has previously appeared on the Earth Mantra release Singularity with Combs, Creek and Haller. He also has organised the Awakenings series of concerts in the UK since 2008, putting on a wide variety of live electronic, ambient, and experimental music. Earth Mantra is very proud to be bringing the music of Modulator ESP to our listeners, and we hope to hear much more from Jez in the future.